Having first been described in the 1940s, the first generation of people diagnosed with autism in childhood are now reaching mid to later life and little is known about what happens during these years. Historically, professionals and researchers have focused their attention to children on the autism spectrum. More recently they have expanded efforts to include individuals in their transition years, which are often referred to as “emerging adulthood.” The autism community has recently expanded its attention to individuals in their mid and senior years, with interest in their physical, social, and mental health needs. However more needs to be known. 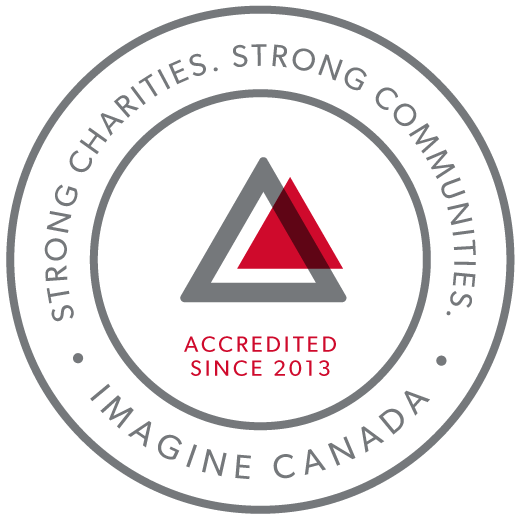 In October 2017, Autism Canada partnered with The Autism Research Institute and the Pacific Autism Family Network to co-host an international Think Tank on Aging and Autism. 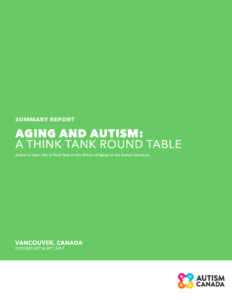 The result is the Summary Report – Aging and Autism: A Think Tank Round Table. This is the first comprehensive report of its kind in North America and comes out of an international delegation of 27 individuals providing the perspectives of adults on the spectrum, researchers, clinicians, service providers, and opinion leaders in the autism field. Similar to their non-autistic peers, individuals on the autism spectrum change as they age; but many of these changes will be different. 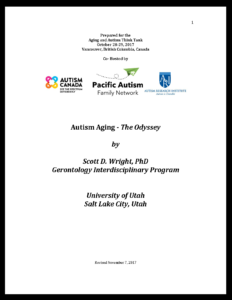 Autism Aging – The Odyssey by Scott D. Writght, PhD, Gerontology Interdisciplinary Program was prepared for the October 2017 Aging and Autism Think Tank.